The pavements of Minster Passage glisten in the rain; viewing York Minster from the junction of Stonegate and Petergate. I am fairly certain that the most interesting doors in York are on Georgian Houses. This splendid example can be found at 17 Aldwark near the Merchant Taylors' Hall. York is noted for the number of Public Houses (Pubs) selling good cask conditioned beers. This one is named after York's big church. You can find the Minster Inn on Marygate just off Bootham about a five minute walk from York Minster. This imposing building used to strike terror into the hearts of learner drivers in York, as it used to be the Driving Test Centre for York. Nowadays it is probably a much more fun place to visit as it is a childrens' nursery. This is the view of Holy Trinity from the Heworth Methodist Church. Heworth Methodist Church is less imposing than Holy Trinity and is situated almost diagonally opposite Holy Trinity a little way into Heworth village. Holy Trinity Church Heworth dominates the cross roads where East Parade crosses Melrosegate and becomes Heworth village. In East Parade, Heworth the Veterinary Surgery is next door to the Doctor's Surgery. You need to be careful when going to the doctor that you get the right gateway or else you might end up with the vet treating you! 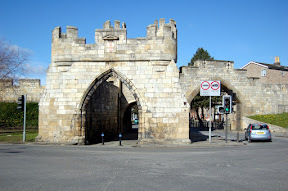 For those travelling into York by road from the west they are welcomed to the city centre by the sight of Micklegate Bar, the western gateway to the city running past All Saints Church towards the River Ouse. Most visitors though will either turn left or right at this point in search of somewhere to park their car. Be warned though, car parking in York is expensive and it is advisable to use one of the many Park and Ride facilities around the perimeter of the city. On a grey cold Sunday morning the Berberis Darwinii lights up the gloom with masses of orange flowers outside this house in East Parade, Heworth. Sunday 20th April was the spring plant show of the Ancient Society of York Florists. There are a great number of classes for showing in. The auricula table looked particularly splendid with many fine specimens. As I was going round though I could hear a lot of muttering about "scorch" but was not looking that closely at the plants myself. Timing of the show makes it a good time for showing tulips as well as the overwhelming number of Daffodils and Narcissi. The daffodils and Narcissi were particularly well represented with a large number of flowers being shown. Primulae and Auriculae were also well represented with these two being my particular favourites. The Tap and Spile pub in Monkgate has a very European looking facade. It serves lunchtime meals and sells a range of cask conditioned beers and runs interesting events like Pork Pie competitions and music nights. Friday nights there is a free folk session that is often jam packed with musicians. Here is the view of the gas pipe bridge over the Foss viewed from the Heworth Green/Malton Road bridge over the River Foss. On the left of the picture you can see the new apartments and offices development on the former gas works site known as The Forum with building names like Milan House and Rome House. The angular concrete bridge used to carry a large diameter gas pipe over the River Foss in the days when Town's gas was manufactured at the gas works that was on the right hand side of the river. The grey bridge in the background carries the stretch of the Malton Road known as Heworth Green over the River Foss. It is not just the gasometer in Layerthorpe reflected on the water of the River Foss , there is also the tree and the blue Unipart building. Call me old fashioned but I just don't understand the architecture of this building. Was the intention that another story should go on top? Did they run out of money to build the second story? Or is it just a case of that is the design? Answer's on a post card please! Fossbank is the location of one of the Sainsbury supermarkets in York and the car park looks out over the River Foss towards the gasometer and former gas works at Layerthorpe. York is not just about ancient history it is also about modern science and technology. The building at the back of the photo is DEFRA the ministry responsible for scientific and technological advice and control to the farming industry, coming forward is another recently built building on the corner of Peaseholme Green belonging to Ware and Kay a firm of solicitors with a section of the city walls marking the boundary by Layerthorpe Bridge. This short stretch of cobbled roadway is Little Shambles leading to the world famous Shambles. It houses the one remaining butcher just on the left as you leave the market area. The market in York is tucked away in a cobbled square behind Marks and Spencer's behind Parliament Street and next to The Shambles. Entrance to the Market area from Parliament Street is under a discreetly green painted archway procaliming the market as "Newgate Market". In addition to the flexible canvas topped stalls in the market are these permanent brick built stalls for vendors selling Chutney, Chese, Fish and Meat. DN1 The Mayoral Car gets a wash.
York having a Lord Mayor has a special car registration DN1 for Mayoral functions. Naturally it needs to be kept sparkling clean and here it is getting a wash and brush up. 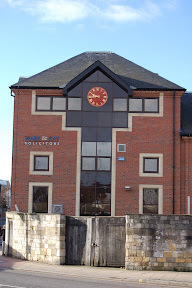 The Ware & Kay Solicitors building has a clock with a very striking red face. The building stands on the corner of Peaseholme Green next to Layerthorpe Bridge behind a sectionof city wall where the wall finishes by Foss Islands and the Kings Pool. In York as in many other towns and cities old properties get bought up by developers and if they don't get knocked down they get turned into apartments or offices. This is the former York County Hospital which houses an office of Yorkshire Water as well as housing apartments. 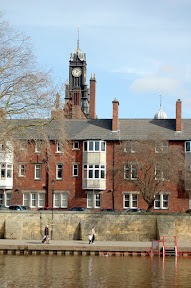 This is a view across the River Ouse from Skeldergate where the clock tower of the magistrates court looms over the surrounding buildings. Prior to it's use as a magistrates court it was the York Technical College which is now housed on the edge of York on Tadcaster Road at Askham Bar. 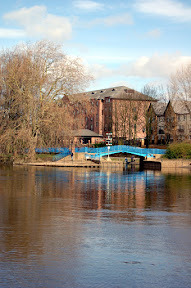 This is the view across the River Ouse towards Blue Bridge where the River Foss joins the River Ouse. The River water level is high though not in flood. When there are high levels of rainfall in the Yorkshire dales the water becomes heavy with peat, hence the brown colouration of the water. 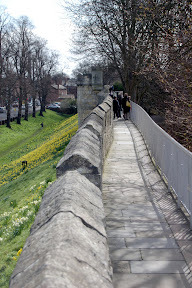 Daffodils by the city walls make a yellow carpet near to the Robin Hood Tower between Bootham Bar and Monk Bar. 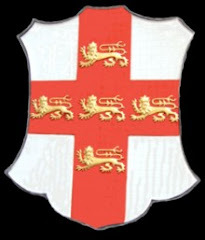 The fraternity of St John the Baptist related to the Taylor's Guild were reponsible for building the hall in the 14th century. However, the 14th century origins of this building are masked by a 17th century brick cladding. 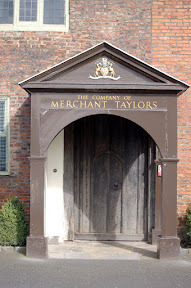 The Taylor's Guild received a Royal Charter of Incorporation in 1661. Inside the building is a wonderful vaulted ceiling with exposed woodwork. There is also a beautiful wooden floor and some excellent painted windows. Unfortunately, the hall is not open to the public and the only way that you can see inside is if you attend a function at the hall. This building has always seemed a bit strange to me as you do not see many buildings in York in which the top half is timber planking. Before the buildings were knocked down I never really noticed the street furniture in this area but with the clutter removed this lamp-post stands out fairly prominently. In the background you can see the top of the BT Garden Place building with communications tower. 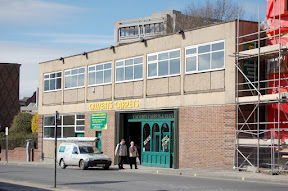 This is a great little carpet warehouse where you can pick up reasonably priced end of roll pieces if you are willing to wait for the right piece to turn up for you. Although the building is similar in style to York's ugliest building which you can just see in the background it is softened slightly by the lower brick level which almost makes it appealing. 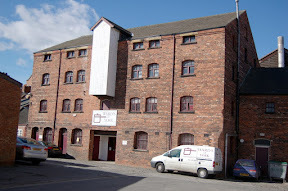 Prior to Calverts taking the building on it was the the home of Pickles Newspaper wholesalers. Next door to it is building work going on where one of the modern timber structured buildings is being erected. 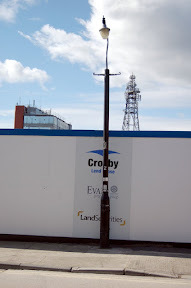 I don't think I have seen any artists impression drawings of what is being erected but hope it is going to be better than the proposed council office over the road which from the artists impression is going to be a monstrosity to rival Stonebow House. 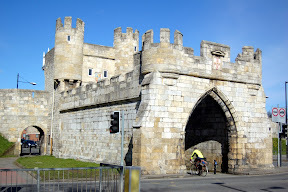 To my mind Walmgate Bar is probably the most dramatic of the gates into York simply because it still retains a barbican. At one time traffic used to pass into the city centre through the arch but as lorries became bigger and wider carrying heavier loads it became a frequent occurence for lorries to get stuck and damage the stonework of the bar. As a result traffic has been re-routed to the right where it can pass through a broader arch in the wall next to the bar. Cyclists as you can see in the above picture can still pass through the central opening. Today the Royal Air Force celebrated 90 years of patrolling our skies. 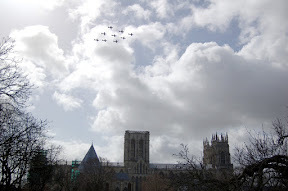 Tucanos from RAF Linton On Ouse fly a diamond nine formation fly past over York Minster at 11:50 as the Station Commander from Linton On Ouse turns the page in the book of rememberance inside York Minster. 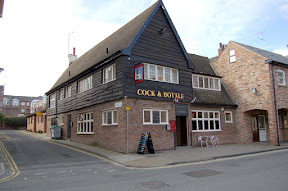 This is a lovely building with lots of character situated just off Walmgate in Hurst's Yard. The present occupants are Ward's Catering Equipmant and Refrigeration. It was formerly occupied by Thompsons of York who used the building as a feed mill before they moved out to their new site at Murton.